In a world where social media and texting seem to dominate, you may be surprised to learn that email use continues to grow at a steady pace among both business professionals and consumers year after year. According to the Radicati Group, 250 billion emails are sent on a daily basis and email is expected to see massive growth this year with 275 billion emails sent daily. As the primary driver of customer acquisition and retention, email marketing produces the highest ROI of all your marketing channels. Email marketing outperforms every other digital marketing practice including SEO, content marketing, paid search and affiliate marketing and according to the DMA, email marketers can expect an ROI of $44 per every dollar spent. 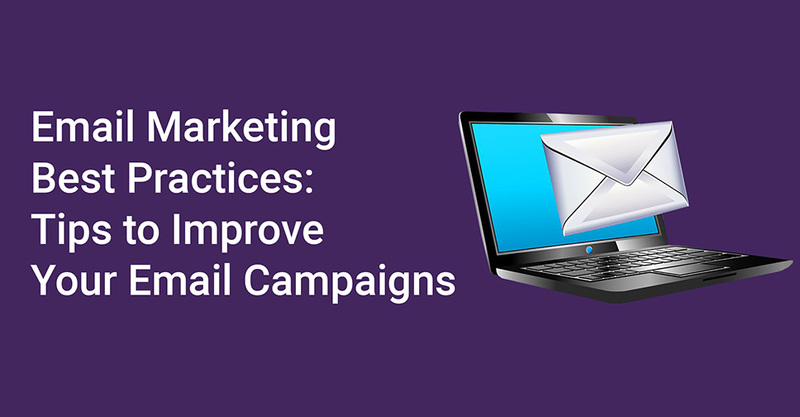 Since email is such a powerful marketing tool, it is important to keep current on best practices so you can continually improve your email marketing campaigns. We’ve compiled some of our best email marketing practices to ensure you stay at the top of your email game. Getting to know your audience is one of the most important things you can do to improve your email strategy. You should understand your audience beyond simple demographics and learn the ins and outs of your audience’s behavior so you can effectively personalize your email messages with the correct language, tone, and delivery that truly engages them. Your email design should align with your overall brand strategy to achieve instant recognition from your email audience. An eye-catching email design with strong images, standout calls to action, and concise messaging are all effective elements in designs that shine. The biggest goal of your email message should be to get your email recipient to click on your content. Featuring an actionable CTA is the biggest opportunity in your email to engage your audience and get them to respond to your offer. Build content around your CTA that inspires a click or action. Review your email engagement after each email send to evaluate the success of your campaign. Engagement metrics like opens, clicks, sales, sign ups, bounces and unsubscribes can give you valuable data about how your audience is responding to your emails. Use the engagement metrics to improve your email campaigns and increase your ROI on future campaigns. Set yourself up for email success by reviewing your email to insure that all the important steps you need to consider before pressing send have been achieved. Important questions to ask yourself include: – Did you customize your from line? – Did you write a compelling subject line? – Did you write a strong message and include engaging images? – Did you include your company’s branding elements? – Did you personalize your content? – Did you include a strong call to action? Your email marketing campaigns will experience higher engagement rates if you personalize and segment your messages to specific demographics, purchasing habits and psychographics that you know about your customers. The more you design your messages around your email recipient’s interests, the more likely you are to engage your customer or prospect. Email messages opened on a mobile device have doubled over the past five years, according to Media Post, so it’s important to make sure your email marketing strategy is mobile friendly and that your email designs render correctly on all mobile email browsers as well as all desktop email clients. Send your email out at the right time for your audience so you have the highest chance of email success. Sending emails out in the morning usually works best as most people check their email first thing in the morning. If your email is sent to a business audience, sending the email out during business hours on business days is optimal. It is important to A/B test every part of your email, from your subject line to your call to action. Test only one element at a time so you can truly track the changes in your campaign results. Test, analyze, optimize and repeat the process until you design the perfect email campaign.